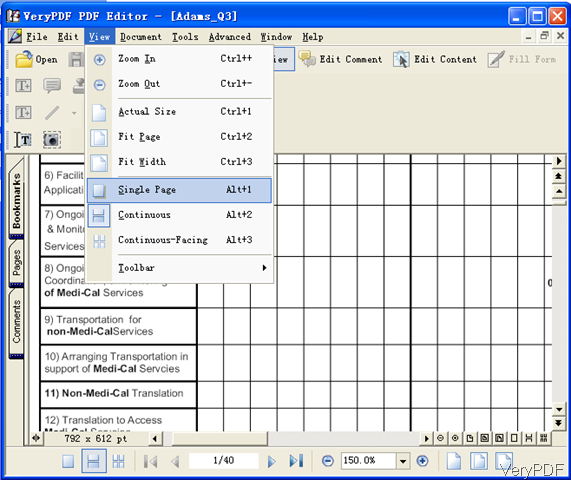 ← How to use PDF Table Extractor OCR software to extract table from color PDF file and save to Excel (XLS, CSV) document? Question:I made a PDF with special fonts Japanese and some Traditional Chinese that I have to present tomorrow at school. Will the fonts show up when I open the PDF on the school computer? Answer:Normally speaking, there will be some problem when you open PDF file with special fonts like Japanese and some Traditional Chinese without corresponding fonts installed by Adobe PDF reader. However, if you install PDF Editor reader, this matter can be solved. VeryPDF PDF Editor can open any PDF with special fonts without downloading font library. In the following part, I will show you how this matter is solved. PDF Editor is Windows application working both 32-bit and 64-bit. Once downloading finishes, there will be an exe file in downloading folder. Please install this software by double clicking the exe and following installation message. Once the installation finishes, there will be an icon on the desktop. Simply click it then you can launch this software. When you open PDF with special characters by Adobe PDF reader, you will get message reminding you to download font from Adobe website or else PDF file can be opened correctly. 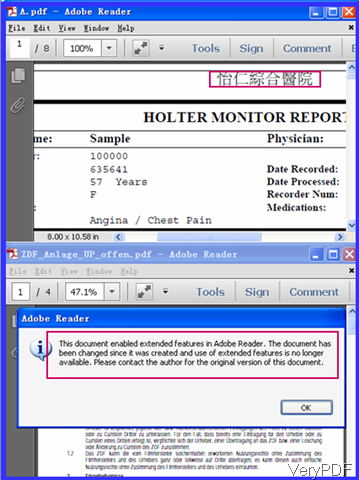 Adobe reader need some font package to display a document correctly when fonts in it are not embedded appropriate into the document. They are also needed when the author does embed the font, but the reader of the document wishes to interact in some way with its content, for example, by collaborating, commenting, or filling out forms. For overcoming this inconvenience, PDF Editor can open PDF with special character without downloading any fonts library. The first snapshot is from PDF with Traditional Chinese character which only can be opened after downloading font from Adobe website. And the second snapshot is from PDF with problem when opened by PDF reader. When you encounter those PDF files, please try to open those PDF files PDF Editor. The following snapshot is from PDF Editor software interface. When you view PDF by PDF Editor, there are many options available for you to choose. Say you can view PDF file by any zoom in and zoom out. It options to show PDF with actual size, fit page, fit width, show single pages, continuous pages , continuous-facing pages or others. Meanwhile, this software also allows you to edit PDF page in various aspects. If you need to know more functions, please visit its homepage. In a word, when you use this editor, you do not need to download pdf fonts even if they are very special. During the using, if you have any question, please contact us as soon as possible. How to draw a handwriting comment in my pdf file with VeryPDF PDF Editor?